Why would you hire a branding strategist to help you with a book? Why would you hire a branding strategist to help you with a book? Wait What Really OK Podcast Episode 71 hosted by Branding Strategist, Speaker, and Author Loren Weisman, discusses the extra piece to bring to the creation of your book while you are writing it. In the writing phase of books, all too often the idea is to just get it published and once it is read, the sales will magically appear. The other misconceptions and assumptions come in to play when authors think about branding at the ... Más informaciones end of the book and marketing the book once it comes out. Why would you hire a brand strategist to help you with your book? So you can write, market, brand and plan the release that much more effectively and productively. To align and define the brand as you are writing the book and while it is being put together can allow you for greater opportunities, more media coverage and a better level of penetration and endurance for sales, opportunities and promotion after it is released. 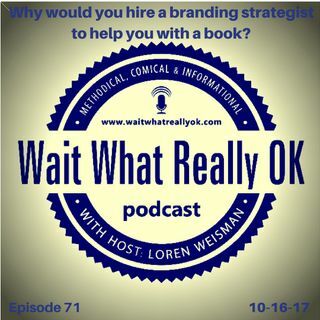 Ep 71 “Why would you hire a branding strategist to help you with a book?” of the Wait What Really OK Podcast is available on iHeartRadio. Hosted by Branding Strategist, Speaker and Author, Loren Weisman, Wait What Really OK is a Brand Management and Marketing Podcast covering the best approaches for business and the arts today. Podcast Blog Supplement for Episode 71 of the Wait What Really OK Podcast with Loren Weisman. Podcast Link Supplement for Episode 71 of the Wait What Really OK Podcast with Loren Weisman. Personal Branding Band Wagon hype. Don't buy in to it and Don't do it! Podcast Video Supplement for Episode 71 of the Wait What Really OK Podcast with Loren Weisman. Podcast Photo Supplement for Episode 71 of the Wait What Really OK Podcast with Loren Weisman.